You might be wondering where last Friday’s post went. Of course, you might also be wondering if the red stripe in candy canes is elf blood. While I’m still waiting or lab results on the candy canes, last Friday’s post is here. Okay, so it’s not Friday, but considering the massive amounts of Thanksgiving emails you probably got, Monday feels like a better day. Friday I was going to tell you about this amazing story my assistant found detailing out how a Bronze Age culture ritualistically ate wolves in order to transform themselves into werewolves. I was going to detail out some of the history of those feral monsters and the lines still in existence today. However, I was reminded on Twitter about the very real and resurgent troll problem. Okay, so I’m sure several of you tuned out, assuming that I’m going the way of the social justice warrior to talk about online bullying, etc. Well, you’d be wrong. I’m talking about the very real creatures that once lurked under our bridges to exact tolls from unsuspecting travelers. 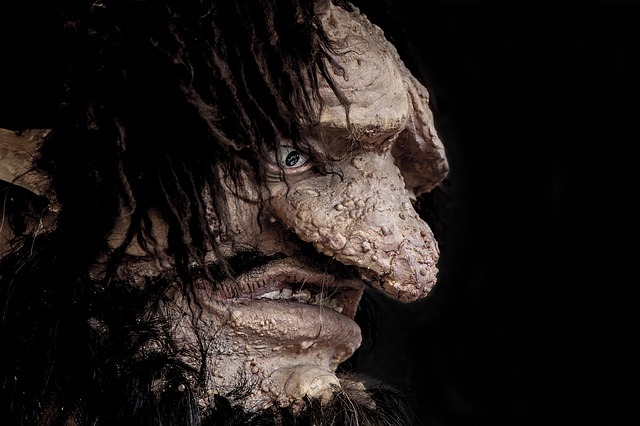 They come in many forms, but the more common troll, troglodytarum communia, is who we’ll be discussing today. The common troll is a large, fleshy mass, normally boulder-shaped and colored. Their diet consists primarily of refuse unless they are able to waylay a tastier creature. However, the sheer effort of hauling their mass around to hunt prevents them from doing much of it, so they prefer to remain motionless and wait for food to reach them. At one point in time, the common troll was on the verge of extinction. The advent of the automobile had drastically whittled away their numbers. (It’s quite hard to demand a toll from a two-ton metal projectile) However, when they discovered the Information Superhighway known today as the Internet, they adapted. In just a few years, the common troll had adapted to add to its diet, emotions such as anger, hatred and the like. (The quantum mechanics of which are best left to the mathematicians.) Now several online trolls are in fact, humans of a questionable humanity. But the massive adaptation of the common troll has led to a new classification of troll, troglodytarum digitus, or digital troll. Beware these foul smelling creatures and make sure not to feed them as their numbers have greatly increased over the past couple years. Do not attempt to engage them online and only attempt to clear a nest of trolls in a large group with superior firepower, preferably in the daytime. Obviously, I am hesitant to send even an intern into such a dangerous area, so instead, one of our interns is tracking down a trollhunter. This may prove difficult as the Icelandic Hunter clans are in the midst of their busy season. Stay tuned for more info.